This Sunday afternoon we will dance like we are in Buenos Aires! Paula Duarte is back and will teach with Bruno a special workshop about the ABRAZO. The embrace… The true essence of Tango Argentino, its heart and soul. Come and explore how to build a solid embrace, and specifically learn how to activate the left part of the embrace. Wait! Isn’t the embrace a set, something like a cast, everything moving together as one? In some situations it is very useful to understand which part of the embrace is working more, or earlier. With this, you can add clarity to your lead and response to the lead. Prepare to be challenged! So come along and learn all the secrets behind why and when to activate the left part of the embrace. After all, with the embrace being the most important element in tango, it’s only natural to focus on its defining parts! The 2 classes will be followed by non stop dancing, sharing cakes and ending the week with a great smile and superb time! 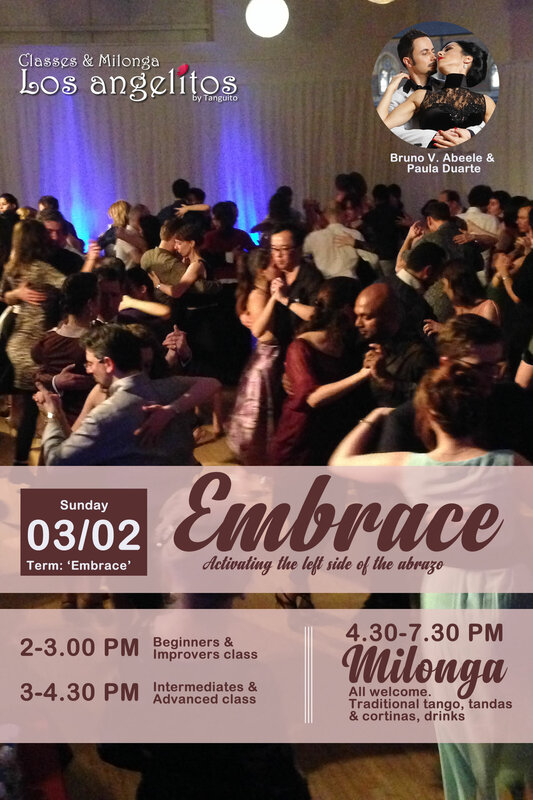 » 4.30pm – 7.30pm MILONGA with DJ Bruno.